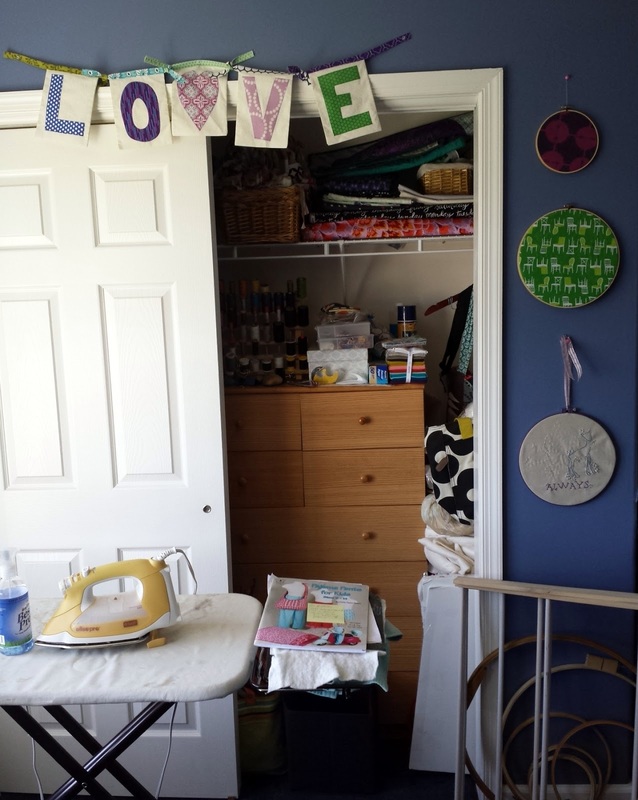 My new sewing room is set up and in working order! It should be no surprise to anyone that I spent most of the first week organizing my sewing stuff rather than personal items. :) It's been two weeks since we moved so all is unpacked now. Almost everything is hung up, and I even kind of sort of cleaned for pictures! This is the guest room at my parents' house, where we are living temporarily to save $$. It used to be my younger brother's room, which is why it's painted blue. I don't mine it much but I do wish it was a bit lighter (dark colors make me feel a bit claustrophobic). However, I get a ton of natural light in this room during the day, which is awesome! I set my desk and sewing table catty-corner so they are always easy to scoot between! You can see my ironing board set up on the far right - an improvement to my old space. 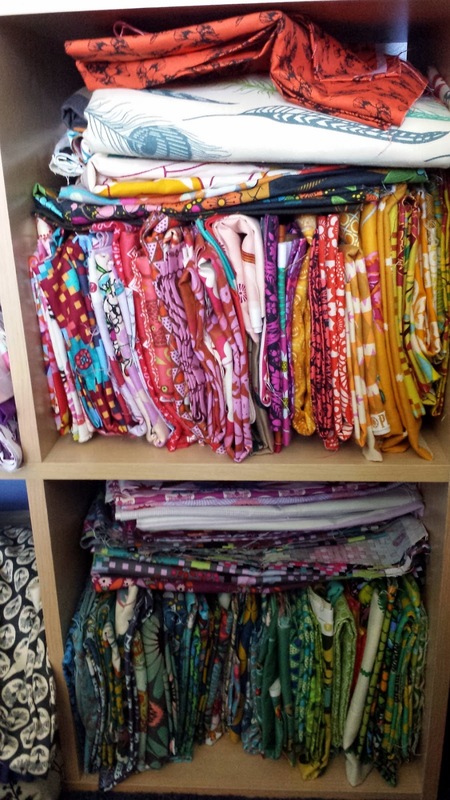 If I need to free motion quilt a large quilt, I can take down the ironing board and add another table in front of my normal sewing table. 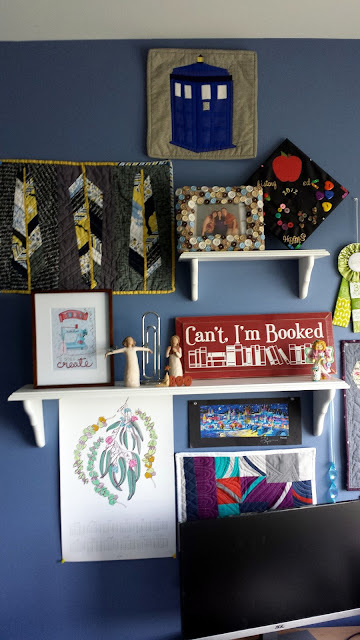 Hanging on top from left to right: Birds of a Feather (by me), TARDIS mini (by my friend @amysblanchard from the CJMQG), CJMQG QuiltCon ribbon (as president, I'm the current keeper!). Below the shelf: Anna Maria Horner calendar, art I bought in Prague (my second favorite city), Wanderer (by me). 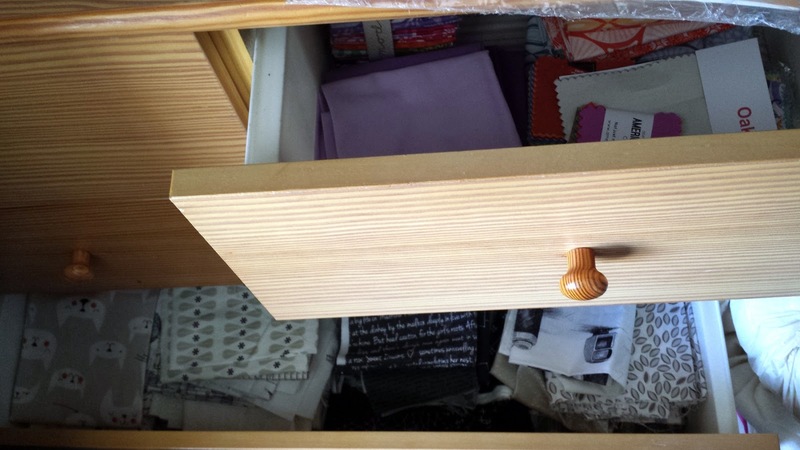 All the drawers are full of fabric. Score. Well not full, but in use. The top two are precuts, and from there I have multicolored fabrics (not pictured), gray, low volume, and black (pictured), and garment fabric (not pictured). If you turn right from there, you'll see most of my stash next to the guest bed! 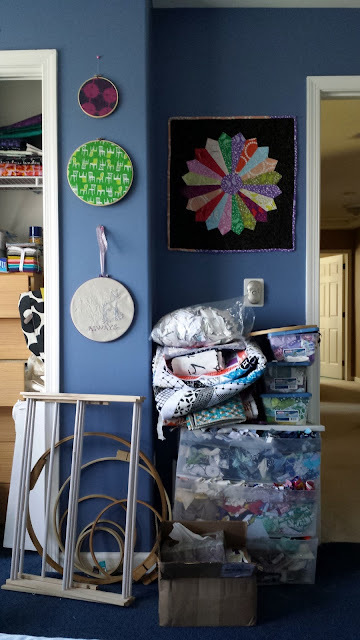 I organized it by color and it's so nice to be able to see everything from where I'm sewing (when I turn around, that is). The blue basket at the bottom contains all of my solids. On top I have a green basket of AMH scraps (because those are special), and a purple basket of WIPs. I hung some more of my favorite fabrics in hoops above, and then my Perspective mini from Heidi - one of my most prized possessions! Behind the door you can see my makeshift design wall (batting tacked with push pins) and my Loominous quilt in progress. All of my AMH stash is together and visible for the first time! Wahoo! This space is cozy and useful but smaller than my previous space in the apartment (mostly because of the full size bed). I have to journey to different parts of the house to take pictures (the dark carpet dims everything) and to baste (I was crawling all over the living room last night) but it will do! Oh my, I'm scared for all your WIPs on top of the scrap bin; it looks ready to give out on you! I can totally relate to having to move something one too many times. I love your mini quilt display, the blue walls actually set them off quite nicely. This looks awesome! What a great creative space. 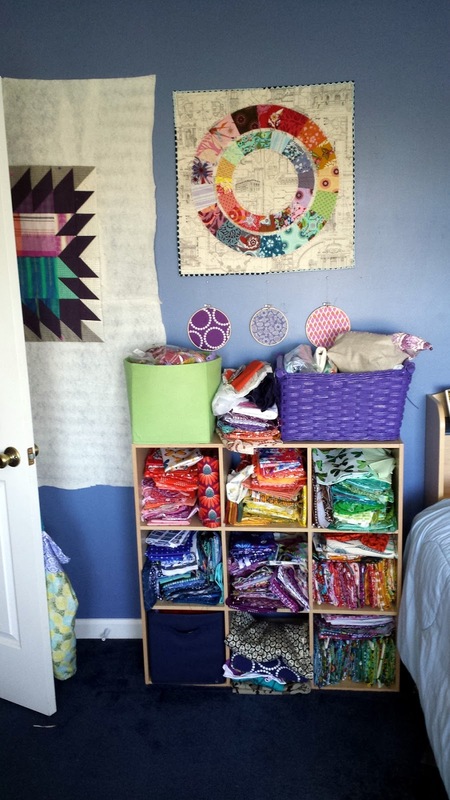 I love the drawers and the cube shelves full of rich, bright fabrics. And all those minis! But there is one missing...just can put my finger on it. I'm totally going to explode trying to think of it. Like, little fragments bursting out all over going crazy... Hopefully the bed isn't being used while you take over this room, right? You can just use it to layout ideas and stuff? 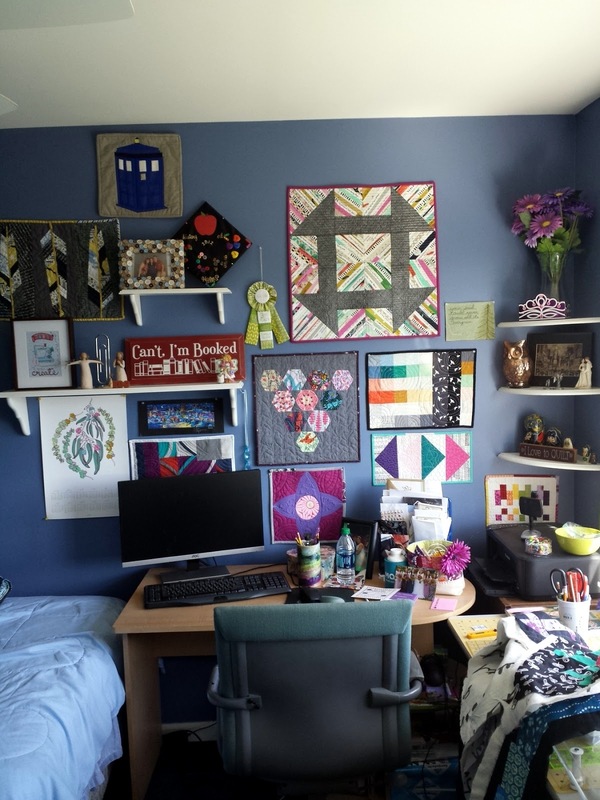 Thanks for showing that I do not need a big room to sew quilts. Love your space. I love you space! Nice job getting everything organized in only a few weeks! We've been in our house for over a year and my sewing room still looks like a fabric store explosion! Love, love, love the mini quilt wall. All the bright colors of your minis and fabric stand out nicely against the dark blue :) I want to come swim in your scraps, OK? How nice that you can live with your parents to save money, and have a sewing room there too! You may find that the bed is useful as a design/layout space. I sort of miss having a bed in my sewing room! 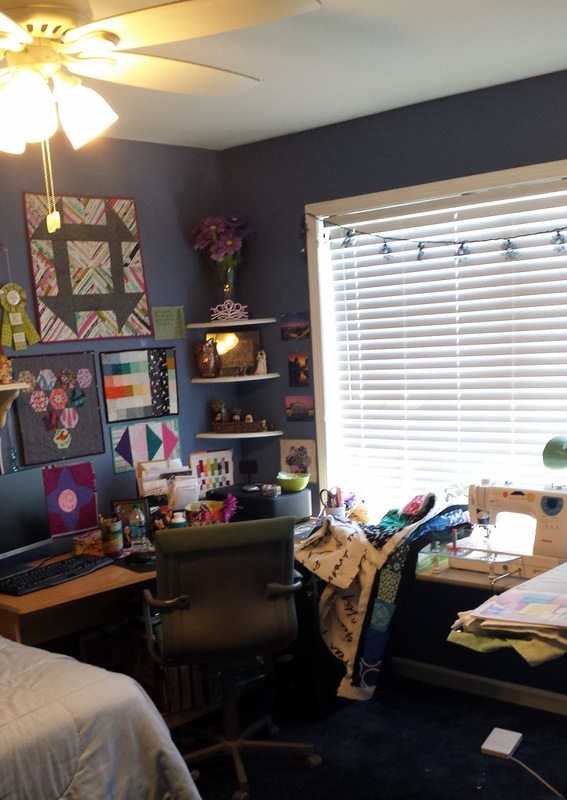 I enjoy seeing other people's sewing spaces - so thanks for the tour! All of your various mini quilts are so cute. Great organization you've done there. 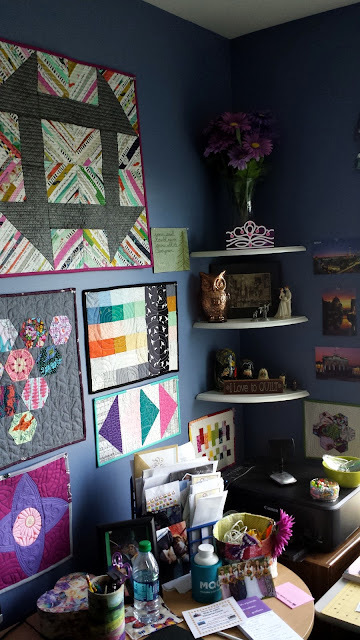 I love, love the mini quilt wall. I may steal your ideas. Great job making this space your own. Happy sewing!